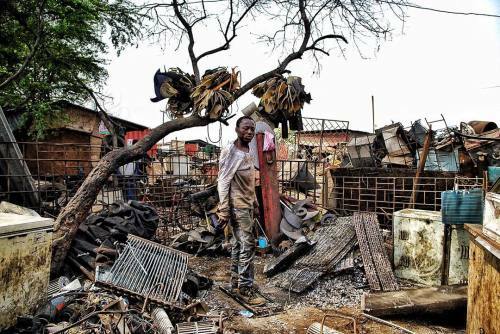 A older man - who didn't want to be identified by his name - works in a scrap yard in the Agbogbloshie dump site. Before the component parts get past off to the teens who work the copper fires, other workers hammer away at car radiators and refrigerator coils to free the hidden copper. The raw copper is sold back to construction and mineral component wholesalers, which reintroduce the recycled copper back into the world market. Once a wetland suburb of Accra, Agbogbloshie is home to a vast dumping ground - once labeled the world's largest e-waste site. While it's been disputed that western e-waste has made its way to Ghana, we should take a moment to think about what happens to all our old computers and phone everything we upgrade. Where does it all go? And how can we do it better? #onassignment #photojournalism #documentary #reportage #ghana #Agbogbloshie #ewaste" By benlowy on Instagram.